Three Luca Toni goals in the space of 24 minutes gave Bayern Munich victory at Hannover. The win maintained Bayern’s three-point lead at the top of the table with rivals Werder Bremen also picking up three points from their match against Nuremburg. Markus Rosenberg and Ivan Klasnic goals gave Werder a 2-0 win. Relegation-threatened Cottbus are getting desperate. 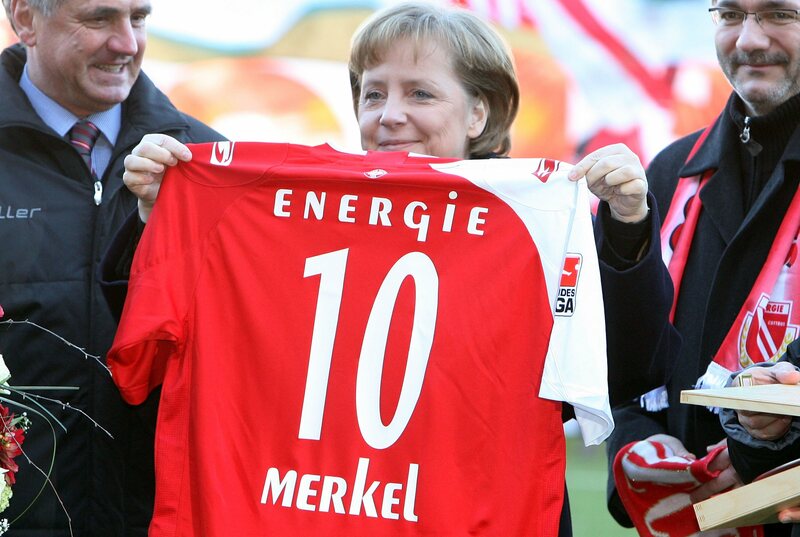 They rolled out a big-name celebrity supporter in a bid to help them to victory at home to Borussia Dortmund. German Chancellor Angela Merkel (pictured above) was on the pitch before kick-off to provide a rousing speech of Delia Smith proportions. Cottbus lost 0-2! Video footage of Toni’s hat-trick and one of the best goal celebrations of all time after the jump! Luca Toni’s quickfire treble against Hannover. Remember England heart-breaker Mladen Petric? Well he is back in my good books. This goal celebration is pure genius. He takes his shirt off (nothing new there you might think), only to reveal an identical shirt underneath! And yes he does get booked if you were wondering!